Are you a lemon or lime lover? 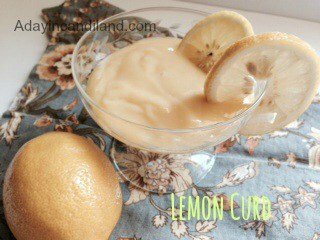 Have you ever tried a Lime Curd recipe or Lemon Curd? It is so good, or crackers, cookies, scones, and toast. How about Key Lime Cupcakes? I made some cupcakes just the other day and I filled them with Key Lime Curd. It can be used with some of my dessert recipes and it gives it just a little kick. It is a simple recipe and only takes 6 ingredients. You can make it in about 15 minutes and it freezes well. Make this tart and sweet Lime Curd to spread on scones, fill cupcakes, and give as gifts. Whisk sugar and cornstarch in heavy sauce pan. Add the egg yolks, zest and lime juice and whisk until well combined. Add small pieces of butter and cook over medium/low heat. (be very careful it doesn't get curdled). Stir constantly for 6 minutes or until mixture is thick enough to hold a line on the back of a wooden spoon. Transfer to a bowl, cover with plastic wrap and refrigerate. This freezes well. You can cut this in half if you need to. Another thing you can do with this recipe is to give it as hostess gifts. Get some ball mason jars and some ribbon and make a homemade tag and give it as a hostess gift during the holidays or a birthday. Another idea is Coconut Lime Sugar Scrub. This is sure to please that friend that needs some pampering. Have you tried lemon or lime curd? 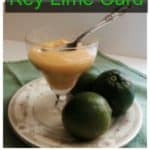 Let me know if you have a favorite recipe for lime curd or what else you have made with it. Make sure you pin this for later. I hope you try it sometime. You can check out my lemon curd also. 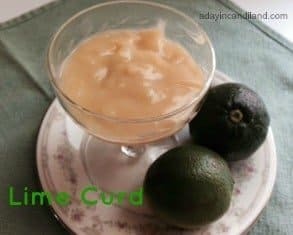 I love lime but haven't tried a curd. Putting it in cupcakes sounds wonderful! I might have to give it a try. Thanks! It's great you can even try the lemon curd and I will be posting a recipe for the cupcakes for both lemon and lime next week. I love lime and lemon curd! We use it as a cake filling instead of buttercream. It helps give a perfect balance between the sweet and tangy. One of my faves. I cannot wait to try this as a filling or just a spread on some English Muffins!!!! Thanks for linking up with us at #Foodie Fridays! You have been pinned!